A big thank you to Marcia at A Girl and Her Books for originating Mailbox Monday. This weekly meme is now on tour with a new host each month. June’s host is Bluestocking. This week I added two new books to my to be read list. The first was Something Deadly This Way Comes by Kim Harrison. It’s the third book in the Madison Avery series. 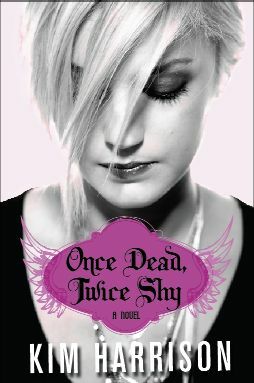 I’ve reviewed the other books – Once Dead, Twice Shy and Early to Death, Early to Rise. It was a Reader’s Choice win from Suzanne Johnson. If you’re interested in paranormal fiction (including YA) she posts each week a list of the upcoming week’s new releases. While in New York last month, I saw several stickers for the video game L.A. Noire. I don’t really pay much attention to what new games are available for our PS3 so my husband had to tell me about it. Tied in to the game is a collection of short stories titled L.A. Noire: The Collected Stories published by Mulholland Books. I didn’t know the contributors beforehand so I was happily surprised to find a new story by Francine Prose. It also has stories from Joyce Carol Oates and Lawrence Block. I’m about half way done with it and so far have been having a good time deconstructing the stories. When we last met Madison Avery she was left in charge of the dark reapers. Not believing in fate, she decides there are going to be new rules put into place. Her reapers are going to give people a choice before they are scythed. That’s right, she’s going to change how her reapers do their jobs. Meanwhile, the light reapers are still using their old rules to run things their way. It’s inevitable the light reapers will get in her way. This book is about the first possible scythe under Madison’s new rules. So don’t expect her to spend a lot of time in school, don’t expect her to see much of her boyfriend, and certainly don’t expect her father to be present in this adventure. The plot is fast paced and I finished this in two days. The ending is tidy for this story but still has loose threads that can be wrapped up in several more books. For instance, there are a lot of possibilities in Madison’s future. She could end up being a Timekeeper that bridges the gap between light and dark; she could find her body and give up the job; or find her body, give up the job, realize she made a big mistake and have herself scythed. And I’m sure there are other possibilities I haven’t foreseen. Over the years I’ve heard Kim Harrison’s name and Amazon keeps trying to recommend her Hollows Series to me. The titles are all clever takes on movie titles (mostly starring Clint Eastwood). It wasn’t until Lisa Damian’s interview with Kim Harrison that I decided I would give the series a try. She seemed like such a nice person, how could I possibly ignore her novels any longer? Months later I found myself reading Dead Witch Walking, the first in the series. In an alternate history, bioengineering created a plague that killed a lot humans. This allowed the supernatural inhabitants (Witches, Pixies, Vampires, Weres, etc.) known as Inderlanders to come out of hiding since they were no longer outnumbered. Humans moved closer to the cities.